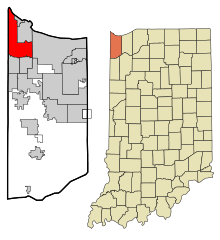 Hammond /ˈhæmənd/ is a city in Lake County, Indiana, United States. It is part of the Chicago metropolitan area. 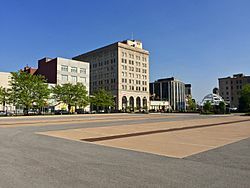 The population was 80,830 at the 2010 census, replacing Gary as the most populous city in Lake County. Hammond is located at (41.611185, −87.493080). The city's elevation above sea level ranges from 577 feet (176 m) to 610 feet (186 m). The city sits within the boundaries of the former Lake Chicago. Most of the city is on sandy soil with a layer of black topsoil that varies from non-existent to several feet (a meter or more) thick. Much of the exposed sand has been removed for purposes such as industrial use to make concrete and glass. According to the 2010 census, Hammond has a total area of 24.886 square miles (64.45 km2), of which 22.78 square miles (59.00 km2) (or 91.54%) is land and 2.106 square miles (5.45 km2) (or 8.46%) is water. As of the census of 2010, there were 80,830 people, 29,949 households, and 19,222 families residing in the city. The population density was 3,548.3 inhabitants per square mile (1,370.0/km2). There were 32,945 housing units at an average density of 1,446.2 per square mile (558.4/km2). The racial makeup of the city was 59.4% White, 22.5% African American, 0.5% Native American, 1.0% Asian, 13.3% from other races, and 3.3% from two or more races. Hispanic or Latino of any race were 34.1% of the population. There were 29,949 households of which 36.2% had children under the age of 18 living with them, 37.0% were married couples living together, 19.7% had a female householder with no husband present, 7.5% had a male householder with no wife present, and 35.8% were non-families. 30.3% of all households were made up of individuals and 9.7% had someone living alone who was 65 years of age or older. The average household size was 2.67 and the average family size was 3.36. The median age in the city was 33.3 years. 27.6% of residents were under the age of 18; 10.1% were between the ages of 18 and 24; 27.3% were from 25 to 44; 24.2% were from 45 to 64; and 10.7% were 65 years of age or older. The gender makeup of the city was 49.0% male and 51.0% female. As of the census of 2000, there were 83,048 people, 32,026 households and 20,880 families residing in the city. The population density was 3,630.0 per square mile (1,401.4/km²). There were 34,139 housing units at an average density of 1,492.2 per square mile (576.1/km²). The racial makeup of the city was 72.35% White, 14.57% African American, 0.41% Native American, 0.46% Asian, 0.08% Pacific Islander, 9.32% from other races, and 2.81% from two or more races. Hispanic or Latino of any race were 21.04% of the population. There were 32,026 households out of which 31.8% had children under the age of 18 living with them, 42.9% were married couples living together, 16.9% had a female householder with no husband present, and 34.8% were non-families. 29.7% of all households were made up of individuals and 10.9% had someone living alone who was 65 years of age or older. The average household size was 2.58 and the average family size was 3.23. In the city, the population was spread out with 27.3% under the age of 18, 9.8% from 18 to 24, 30.1% from 25 to 44, 19.8% from 45 to 64, and 13.0% who were 65 years of age or older. The median age was 34 years. For every 100 females there were 95.3 males. For every 100 females age 18 and over, there were 92.2 males. The median income for a household in the city was $35,528, and the median income for a family was $42,221. Males had a median income of $35,778 versus $25,180 for females. The per capita income for the city was $16,254. About 12.0% of families and 14.3% of the population were below the poverty line, including 19.7% of those under age 18 and 9.3% of those age 65 or over. Robertsdale – The Whiting post office (46394) serves not only the city of Whiting but also this adjacent neighborhood in Hammond, immediately to the west of Whiting. Addresses in this Robertsdale show "Whiting, Indiana." While not legally a part of the city of Whiting, locally the area has long been informally considered to be a culturally integrated part of Whiting. References to Whiting businesses or residents often include those technically from Hammond's Robertsdale neighborhood. The first permanent residents arrived around 1847 to settle on land between the Grand and Little Calumet rivers, on the south end of Lake Michigan. Those first residents were German farmers newly arrived from Europe looking for land and opportunity. Before that time, the area was a crossroad for Indian tribes, explorers, stagecoach lines and supply lines to the West. Convenient location and abundant fresh water from Lake Michigan led to the beginning of Hammond's industrialization in 1869 with the George H. Hammond Company meat-packing plant following merchants and farmers to the area. Hammond was incorporated on April 21, 1884, and was named after the Detroit butcher. Hammond is one of the oldest cities in Lake County, with Crown Point being the oldest, established in 1834. According to the Encyclopedia of Chicago, George Henry Hammond, a pioneer in the use of refrigerated railcars for the transport of fresh meat, first used this method with his small packing company in Detroit, Michigan. In 1868, Hammond received a patent for a refrigerator car design. In the early 1870s, he built a new plant in northern Indiana along the tracks of the Michigan Central Railroad. By 1873, the George H. Hammond Co. was selling $1 million worth of meat a year; by 1875, sales were nearly $2 million. The company's large packing house in Hammond—the town had taken the name of its most powerful resident—rivaled those located at the Union Stock Yard in Chicago. By the middle of the 1880s, when it built a new plant in Omaha, Nebraska, Hammond was slaughtering over 100,000 cattle a year and owned a fleet of 800 refrigerator cars. After Hammond died in 1886, the company became less important and no longer challenged the giant Chicago packers, who acquired Hammond at the turn of the century and merged it into their National Packing Co.
On June 22, 1918, the Hammond circus train wreck occurred about 5.5 miles (8.9 km) east of the city, killing 86 and injuring 127 persons. 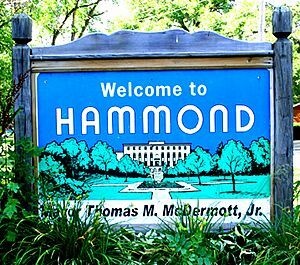 According to the 1960 U.S. Census Hammond's population reached a record high of 111,698 residents. Hammond, Indiana Facts for Kids. Kiddle Encyclopedia.